An easy, healthy and delicious gluten-free artisan bread (boule) made with a combination of brown rice, buckwheat, almond and tapioca flours. 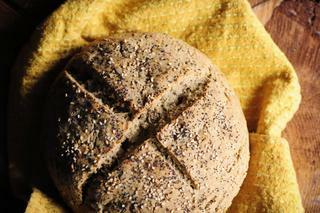 This beautiful yeasted bread will impress the pickiest of guests! This gorgeous boule is so easy and so tasty, that it's genuinely hard to believe that it is gluten-free . . . This delightful bread is incredibly easy to prepare and the dough works like a dream. Shape it, let it rise, pop it in the oven and you have one impressive gluten-free artisan bread! Once you try it, I guarantee it will become a staple served alongside your favorite meals . . . In a large mixing bowl combine dry ingredients brown rice flour through yeast. Stir to combine.In another mixing bowl combine wet ingredients milk through vinegar. Whisk to combine.Pour your wet ingredients into your dry and mix until a smooth dough forms.Place dough onto a well floured surface and knead for 1-2 minutes. Form dough into a ball.Place your boule into a cast iron skillet, cookie sheet or cake pan.Using a wet knife slice a "X" into the top of the dough.Sprinkle top with sea salt and seeds of choice.Cover dough, place in a dark, warm place and let rise for one hour.When you are ready to bake, preheat oven to 350°F.Uncover your dough, spray with water and place into preheated oven.Bake for 35 minutes or until edges are golden and the bread makes a hollow sound when you tap it.Let cool before slicing and serving.Enjoy!